Russel Norman, Jeanette Fitzsimons and Keith Locke's comrades in the Australian, Democratic Socialist Perspective, love Venezuela's Marxist strongman, Hugo Chavez, like a chocolate. Here are excerpts from an article in GreenLeft Weekly from February 1, 2006 by long time DSP member Jim McIlroy, on Chavez's speech at the recent World Social Forum in Caracas. Venezuelan President Hugo Chavez proclaimed “socialism or death” in finishing his rousing speech to a rally of around 10,000 people at the Polihedro Stadium on January 27. The rally was a feature of the Latin American section of the Sixth World Social Forum held in Caracas on January 24-29. The forum attracted an audience of up to 100,000 people from all over Latin America and the world, to a feast of more than 2000 public meetings and seminars on themes of anti-imperialist globalisation and the struggle for a better world. Chavez said that unlike Karl Marx, when he first issued the call for socialism in the 19th century, “we do not have much time left”. The 21st century has now come, “when the dilemma must be finally resolved”. 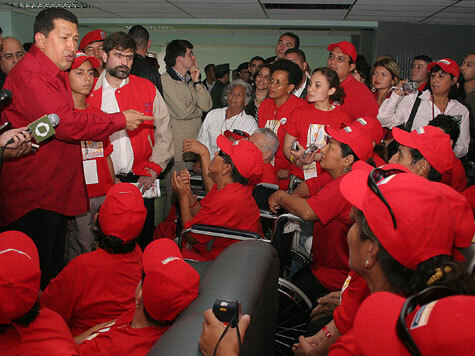 Chavez contrasted the US’s record to the achievements of the Bolivarian revolution in Venezuela, with the help of Cuba, which taught 1.5 million people to read through Mission Robinson in just two years. Many prominent figures in the international progressive movement were featured on a podium, including Aleida Guevara (Che’s daughter) and Cindy Sheehan (US anti-war leader whose son was killed in Iraq). Huge applause greeted Chavez’s speech, and the rally included a rousing rendition of the workers’ anthem, “The Internationale”. Chavez’s stress on the need for urgent international political action against global capitalism and oppression was a major theme of the forum. The whole conference was filled with the overwhelming influence of the Venezuelan revolution. The “Bolivarian spirit” was pervasive from the very first day, when around 20,000 activists marched to launch the WSF. The lively and colourful march featured the banners, clothing and chants of the many national contingents, especially from Latin America. Venezuelans, however, are not loving Chavez that much. Hugo Chavez’s vote intention is below 50% for the first time since 2004, reports a survey conducted by Venezuelan pollster Datanálisis. That is a dramatic fall from the 71.8% recorded last July by the same surveyor. Chavez’s vote intention has roller coasted from 30% in July 2003 to almost 80% last year and is now below the 50s. Declared Chavistas are 43% of the population, 35% defined themselves as neutral and 15.5% as opposition. Trust in Chavez is at 53% and distrust at 35.5%. This survey confirms a trend first reported last January by DATOS, other local surveyor. DATOS that measured trust on Chavez in 43% and gave his party Movimiento Quinta República a vote intention of 37.6%. Chavez´s star is falling, but not fast enough to risk his office. Opposition is fragmented and alternative leadership is virtually nonexistent. That's interesting Camilo. Is there any chance of a united opposition to Chavez? What do you think he would do if he lost an election?